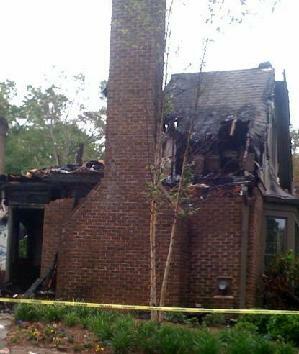 This home in Atlanta area (without protection) recently received a direct lightning strike, resulting in a fire. Lightning is a unique and powerful form of electricity. A typical volt contains 30 million volts of destruction. Lightning is responsible for deaths, injuries, and destruction equivalent in magnitude to those caused by all other natural disasters combined, including floods, hurricanes and tornadoes. What happens if lightning strikes a building that does not have a lightning protection system? Direct strikes to buildings will commonly result in a fire that starts on the roof or in the attic. Every year in the United States the number of homes struck by lightning increases. According to the Insurance Information Institute, residential lightning losses exceed a billion dollars annually. Why risk? A lightning strike to an unprotected home can be catastrophic. A lightning protection system performs a simple task. It provides a specified path on which lightning can travel. When a home is equipped with a lightning protection system, the destructive power of the lightning strike is directed safely into the ground, leaving the home, family members and personal belongings unharmed. Since the invention of lightning rods in the mid-18th century, the technology of lightning protection has evolved to afford proven protection against lightning loss. Today's lightning protection systems are specifically designed to protect you and your family, using technology in compliance with U.S. Safety Standards. The lightning protection system consists of air terminals (rods), conductor (cable), bonding with metallic bodies, and ground electrodes(counterpoise cable or ground rods), designed to protect a structure and its occupants. A lightning protection system may be complemented with surge suppression, custom tailored to your needs. The lightning protection system is custom designed for each building prior to installation. It can be concealed during construction, or carefully semi-concealed on existing homes. Systems may be specifically designed to protect a wide range of architectures without compromising aesthetics. A correctly installed lightning protection system gives you and your family peace of mind and increases the value of your home. It is essential that lightning protection systems are installed by trained, qualified lightning protection specialists. For quality assurance all materials and methods should comply with nationally recognized safety standards as established by Underwriters Laboratories and the National Fire Protection Association.